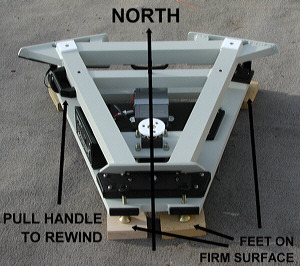 Our Equatorial Platforms are precision tracking devices for Dobsonian Telescopes. They are true equatorial mounts, though at first glance that is hard to believe. They certainly don�t LOOK like a normal German or Fork mount. Actually, these Platforms are very similar in operating principal to a Split-ring or Horseshoe equatorial mount. The key difference is that only two short arcs of the whole ring or horseshoe are used, with the rest of the structure made flat to accommodate a Dobsonian telescope on top. 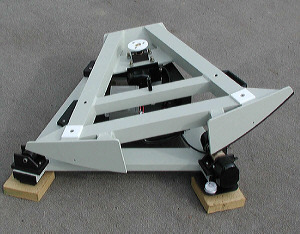 Putting a Dobsonian on a low profile Equatorial mount like one of our Platforms gives you a complete observing system, with two big pluses over other types of drives for Dobs. First, you can still move the Dob around like always. There are no clutches to deal with - just grab the scope and move to your object. Wherever you point, you will be tracking. Secondly, because the tracking motion is equatorial, there is no field rotation. This is a big plus for astrophotography and CCD imaging. 1. 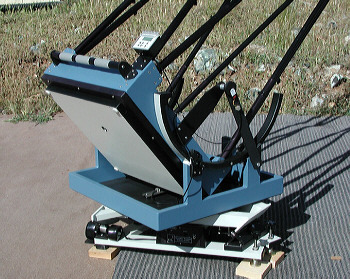 THE TOP ROCKING PLATE (TRP): A triangular platform on which swivels the Dobsonian telescope. 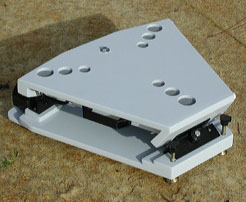 Three curved "feet" are attached to this top plate. These curved "feet", allow the top plate to rock equatorially through a 20 degree arc, corresponding to 80 minutes of tracking. 2. THE BOTTOM SUPPORT PLATE (BSP): This plate sits on the ground. Mounted to it are the two north "roller" bearings and the three south bearings which all support the top plate and allow it to rock equatorially. 3. 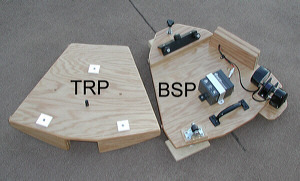 THE DRIVE SYSTEM: This includes the motor(s) and motor controllers that allow the TRP to move in a true equatorial tracking motion over the BSP. More details and specifications of the various drive systems we offer on our Platforms can be seen in the �Platform Models� section below. The two illustrations below demonstrate the movement of the Platform during its extended 80 minute tracking run. The "rocking" movement is clearly seen. During the tracking run, the top plate begins at 10 degrees to the east, then rocks to a level position and finally ends up tilting 10 degrees west. The Platform can then be quickly reset for a new tracking run with a simple pull of a handle. This takes about 3 seconds to do. Here is a little movie that illustrates the movement of an Aluminum Platform through its tracking run. (Be patient: it might take a minute or two to download.) The direct roller drive on the large sector offers superior tracking. The Platforms we sell are NOT cookie-cutter, one-size-fits-all products. Each Platform is CUSTOM ENGINEERED AND MANUFACTURED to the buyer's needs and specifications as to latitude range, size and weight of telescope, optional accessories wanted, etc. You get the exact Platform that is best for your needs. 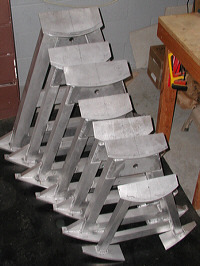 These two pictures show a group of Top Plates for Aluminum Platforms and a group for wooden Platforms. None of them are identical. Each one is targeted to be the best available Platform for the buyer's needs, equipment, anticipated use, desired options, etc. The two pictures at below are examples of the kind of customizing we routinely do for our customers. First is an Aluminum Platform built to accept both a 25� and a 30� Obsession Telescope. The other picture shows a wooden Platform that was built to carry either a 7�, 10� or a 14� Teleport Telescope. It is even painted with the Teleport finish! We build our Platforms in small production runs of 15-18 at a time. That way, each unit can get a lot of care and attention as it goes through more than 100 construction steps. There is no getting around it: an Equatorial Platform is a tricky device to make well. There are a multitude of bearing surfaces that all need to be lined up precisely with their respective bearings. There are quite a few angles that need to be measured and cut to high degree of accuracy. Clearances for all the parts as the Platform moves during its tracking need to be allowed for and built in. The drive controllers and motors have to be mounted to close tolerances. This is where our 18 years of experience in designing and building Platforms comes in handy! We know what works. We have a clear idea of the sequence of steps needed to produce the final product. And most importantly, we never give up seeking ways to improve the design, the appearance, and the performance of our Equatorial Platforms. As extra insurance that our customers receive a perfectly functioning Platform right out of the box, we star test and calibrate every unit before it is shipped. That�s right, no Platform is allowed to leave our hands until it has been actually used under observing conditions, even if that means delaying shipping until after a clear night. That�s part of our guarantee that you won�t be disappointed when purchasing one of our Platforms. All of our Platforms utilize the best materials available. The wooden Platforms are manufactured from Apple-ply or Baltic Birch plywoods. 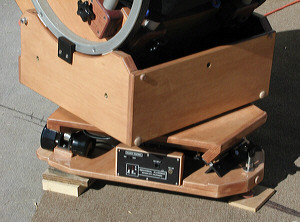 Or, for those who want their Platform to match their Starmaster or Tectron telescope, then a grade A Red Oak Plywood is used. 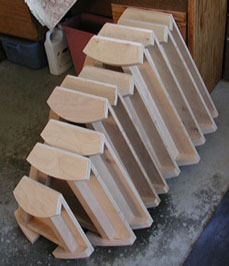 Solid hardwood rails - either Maple, Alder, or Oak - are added as stiffening members. A lot of care is taken with the finishing of the wooden Platforms, beginning with a three step sanding process. The wood is then oil stained (unless it is getting a clear finish) and finally an outdoor polyurethane is applied in several coats for a long lasting finish that matches your telescope. The Aluminum Platforms use square and rectangular aluminum tubing that is carefully cut, jigged up and welded. This makes for an extremely rigid but lightweight structure. The welds are then ground flat for a neat and seamless appearance. The final finish on the aluminum is an extremely durable, impact-resistant powder coat finish. 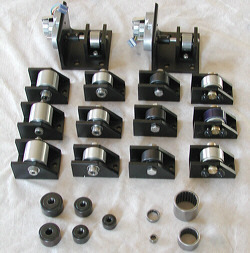 The drive components, bearings and bearing supports are of similar high quality. We do quite a bit of the metal fabrication in-house with a 12x36 precision lathe and Bridgeport mill. The remaining metal work is contracted out to selected machine shops that have the needed specialized equipment. Many of the Platform parts, especially the bearing supports, are custom designed and machined out of heavy wall aluminum extrusions. All of the finished aluminum pieces are black anodized for durability and a pleasing appearance. All of the Platform fasteners are of stainless steel or anodized aluminum for maximum corrosion resistance. The bearings themselves - there are 5-12 in each Platform - are roller or needle bearings designed to handle many times the weight of the telescope. They make for an absolutely smooth tracking movement. What a pleasure to view an object at high power as it hangs there motionless in the center of the field! Our wooden and our welded Aluminum Platforms come in two basic models, the Standard Single-axis and the Standard Dual-axis. Both types are similar in size and appearance. Both offer the same peerless tracking. The two models differ primarily in respect to their drive components. The Single-axis Platform drive utilizes one stepper motor which is mounted to one of the north roller bearings. As this motor turns it causes the top rocking plate (and the telescope that sits on it) to move equatorially. A hand control with a quartz drive microprocessor allows the exact sidereal rate of tracking to be tuned in. Additionally, push buttons on the hand control offer a two-speed slew in Right Ascension for centering objects in the field of view. This whole drive system runs off of an included 12V DC rechargeable battery, perfect for use at remote dark sky sites. If you are primarily a visual viewer, then the Single-axis Platform is a perfect fit. 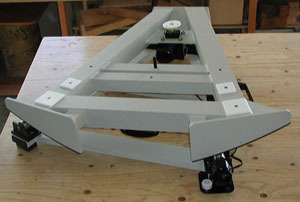 The Dual-axis Platform utilizes two stepper motors connected to the RA drive roller and one stepper motor connected to a DEC drive. A micro-processor mounted on the Platform controls these stepper motors. The Platform is powered by 12V DC, either by an optional built-in battery or by a user supplied power source. The included hand control allows one to fine tune the tracking rate and gives one a two-speed slew in both RA and DEC for centering objects in the field of view or on a CCD chip. You can also do auto-guiding with the Dual-axis Platform, using commonly available auto-guiding cameras. Bottom line, for those who wish to do any kind of imaging (including video viewing with a MallinCam type camera), the Dual-axis Platform, with its slew controls in both RA and DEC, is a necessity. 1) Set the Platform on a hard surface with the bubble level facing north. Then use the Platform�s adjustment screws or shims, as needed, so it is level and sits solidly on the ground. 2) Polar alignment for visual use is easy. After the Platform is leveled, make sure its center line points roughly toward Polaris. See the illustration at left. During the day a compass can be used, taking care to allow for the true/magnetic north offset for your location. Quick and accurate polar alignment can also be done with our new Polar Alignment Tool. For astro-imaging, more accurate polar alignment can be achieved with the standard star-drift method, as with any equatorial mount. 3) Note that, although the Platform is built to work leveled at the Platform�s �nominal� latitude, it can be used at other latitudes by simply shimming up the north or south end the appropriate number of degrees. For example, a Platform built for 40o latitude can be used at 37o by raising the SOUTH end 3o . For 43o the NORTH end would be raised up 3o . Using this method, you will have at least a +/- 6o range. That is over a 1000 miles North/South. For example, we use the same Platform with our 22� scope at RTMC in southern CA and at TMSP in central Washington State. (Even a longer range is possible, for those who need it, with our auxillary Platform wedge.) 4) Now place your Dobsonian telescope on the Platform. Most of our customers have the Platform configured as a new groundboard for their telescope. The top of the Platform has a center pivot and three teflon pads to accept the rocker box of the scope (after the stock groundboard has been removed). This arrangement is very stable and keeps the eyepiece height as low as possible. However, we can also configure the Platform to accept the whole telescope with its stock groundboard. For some scopes, such as the Teleports, that is a more feasible arrangement. This kind of customization to your needs is done at no extra charge. 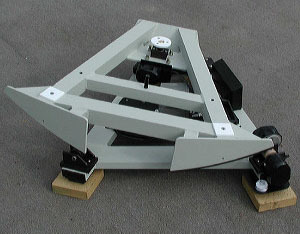 The larger and heavier telescopes can be brought up onto the Platform using a low set of ramps. Here is a nice illustrated story of how one of our customers gets his 20� Obsession on his Platform. 5) Now just turn on the RA drive motor (using the "off-on" switch on the control panel) and you are tracking! Grab the scope and move it, just like always. There are no clutches or levers to disengage. Wherever you point you are tracking, quietly and precisely. Break out those high power eyepieces you seldom used in the past, and get the views you should be getting. Call your friends and neighbors over - everyone gets to observe for as long as they want with no hassle. With tracking you will flat out see more - it�s like adding inches to your mirror. Add Sky Commander or the powerful new Argo Navis to your Dob/Platform observing system and you will have a full GoTo setup. Bring one of the thousands of objects in the computer module up onto the screen, and the readout will tell you how to move the scope - how to �go-to� the object. So, with your hand (instead of slow noisy motors) supplying the �go-to� power you can quickly be on your target and watch it hang there as the Platform tracks. You move from one object to another quickly and quietly. It�s fun to do surveys using this elegant GoTo ability. A perusal of the Fall Planetaries, for instance, or the star clusters of Cassiopeia or the globulars in Ophiuchus. One of our favorites is to do a survey of all the doubles listed in a single constellation. There might be 10 or 15 of them. Try doing this in twilight, when it is just dark enough to do the two-star alignment for the night. Observing doubles at that time is a real treat. The colors seem more ethereal against the dark blue sky. You can hop from one to another quickly, observing the delightful differences in the magnitudes, colors, and separations. The Platform GoTo ability is a real friend for the both the casual viewer and the serious Deep Sky hunter. You can locate 60 or more objects an hour if you wish.Both Sky Commander and Argo Navis have these same Platform-friendly features: 1) There is a Platform mode. The computer recognizes that you have an alt/az scope tracking equatorially. So it turns off its internal clock since the movement of the Platform acts like a clock. This means you do your two-star alignment, and then can use the DSCs for the full tracking run (usually 75-90 minutes), effortlessly finding object after object. 2) There is a Platform reset button. After you do the reset to get another tracking run, simply push that button and the readout on the screen will update to the new place in the sky you are pointed after the reset. No need to redo the two-star alignment procedure. Couldn�t be simpler. Check the Sky Commander and Argo Navis websites for full details about other neat features, such as a heater for the display window to keep it from fogging.